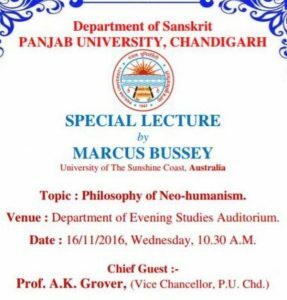 Marcus Bussey, Senior lecturer at the University of the Sunshine Coast, Australia delivered a lecture on ‘Philosophy of Neohumanism’ at Panjab University (PU), in Chandigarh, India, on November 16th, 2016. The lecture was organized by the PU department of Sanskrit. PU’s vice-chancellor, Professor Arun Kumar Grover, was the chief guest and Dr. Shambhushivananda presided over the lecture. Professors and chair persons of various departments attended the lecture. Scholars from Germany, USA, and Malaysia also participated in the lecture. The audience participated in post-lecture questions. of Educational Futures at NITTTR.The department was so impressed with Dr. Marcus Bussey’s lecture that they asked him to speak again the following day on Neohumanism in Swami Vivekananda Centre at Panjab University. Hence, on November 17th the Interdisciplinary Centre for Swami Vivekananda Studies organized two lectures at the Guru Tegh Bahadur Bhawan. 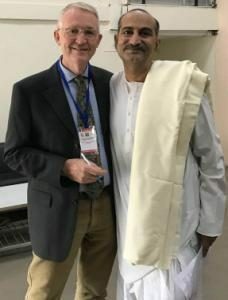 The first lecture was delivered by Dr. Sid Jordan who gave a talk on Biopsychology and Yoga Sadhana. 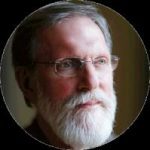 Dr. Sid Jordan has combined a career as a licensed clinical psychologist and meditation teacher since 1971 in the USA. 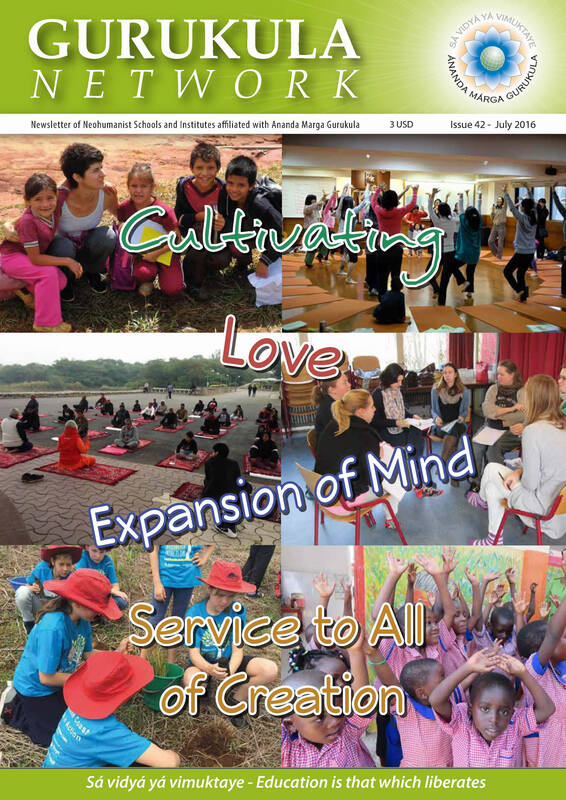 He told students about the biopsychology of the chakra system which provides a systematic approach to transferring human qualities of the mind from the crudest expression to the subtlest Supreme Consciousness. Dr. Jordan also explained that yoga is not just an exercise for the body; it develops the body, mind and spirit. A clear understanding of yoga postures helps us understand how to develop mental clarity and a sense of belonging in the body which is a spiritual vehicle. He concluded that yoga is equal to merger with the divine. The Second lecture was on Neohumanism, Education and Spirituality by Dr. Marcus Bussey. 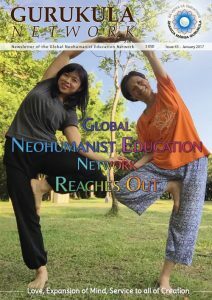 He discussed how Neohumanism offers a new vision of human potential in which the physical, the mental and the spiritual support one another. Education in this light must cater to all three areas. Teachers are not information managers but guides to a rich human future. The lectures were followed by an interactive session. Prof. Nandita Singh, Coordinator, Interdisciplinary Centre for Swami Vivekananda Studies, made the concluding remarks for the event and also gave a token of thanks to the resource persons.